Posted	 September 13, 2017 by	Sikh Dharma International & filed under Prosperity, Prosperity Shabads. If I could live for millions and millions of years, with only air for my food and drink. The True Lord, the Formless One, You hold a place all your own. Neither eating nor drinking anything-even so, I could not estimate Your Value. 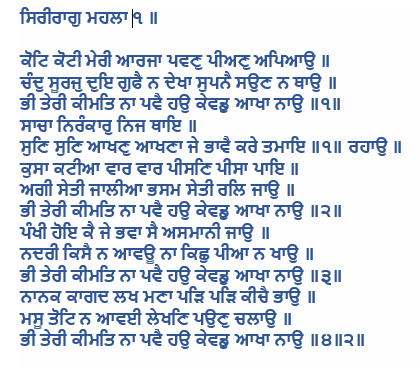 O Nanak, if I had hundreds of thousands of stacks of paper, and an unlimited supply of ink.